Traditional Family Fun has been the name of the game here at Waldameer and Water World for 118 years. Many of our rides, slides, and attractions have been enjoyed by multiple generations. As much as we all enjoy that flashy new ride or slide, we take pride in our traditional family rides. 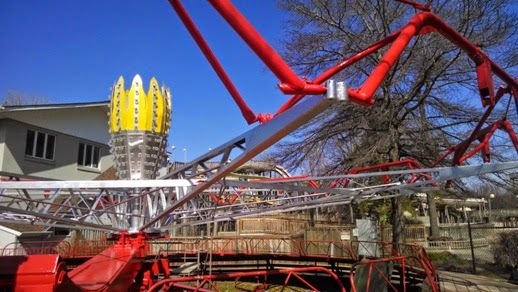 Going into 2014, Waldameer has been hard at work since Labor Day of 2013 to keep our family classics thrilling riders for generations to come. This week, we are putting the finishing touches on two refresh projects for two of our popular classic rides. Between these two rides, there are 60 years of Family Fun. Let's see what's new for these venerable family classics. It's a 2 for 1 Special on our Park Improvement Map! Click Image to Enlarge. Only one more surprise for 2014 to go! 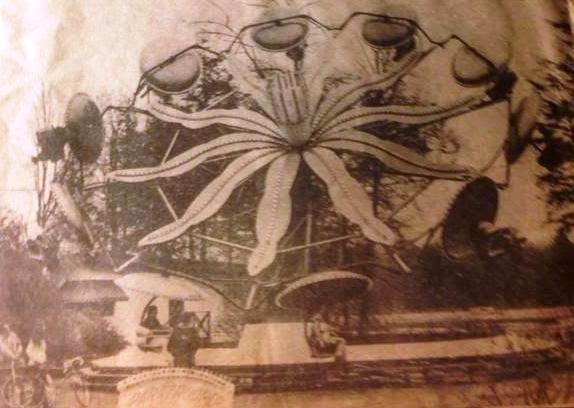 Paratrooper is undergoing a beautiful repainting project that could fool anyone as a brand new ride. A nice sunny day to dry all of the wet paint. Once we are done painting the blue and yellow decorations, we can reattach them and add the "parachute" chairs back on. 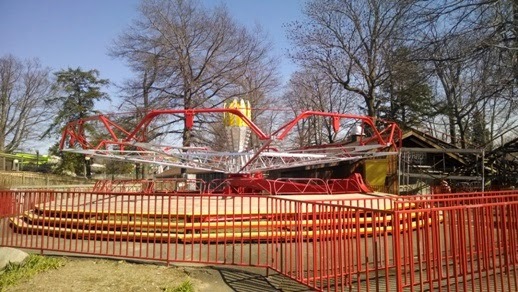 In addition, Paratrooper received an upgraded centerpiece for a much more visually appealing night ride experience as we won't have to fuss around with old lights going on and off anymore. 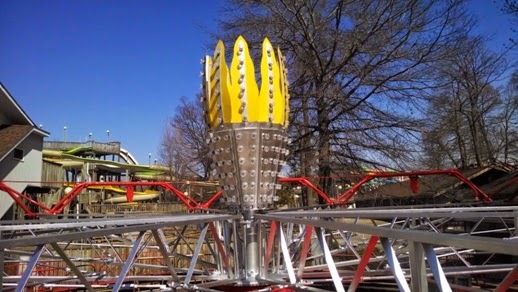 Can't wait to see Paratrooper spinning at night with the new centerpiece! Furthermore, Waldameeer has made a policy revision on Paratrooper that is much more convenient for our guests. After a careful safety analysis, beginning in 2014 footwear without backs is now permitted on Paratrooper, and guests will have the option of removing and holding onto loose footwear if they desire to. No longer will anyone find themselves disappointed that they could not ride Paratrooper due to their flip flops or shoes without backs. 2014 will be Paratrooper's 41st Season. Check out this rare photo from a 1973 newspaper article! Wipeout in its early days. Strange not seeing Ravine Flyer II towering over. 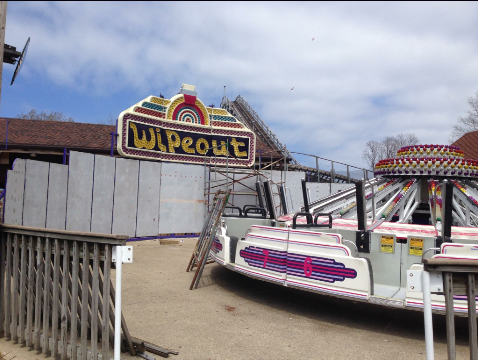 Closing in on almost 20 years at Waldameer, Wipeout was due for a makeover. Our backdrop was getting a little faded, and some lights needed repaired. For the 2014 season, a colorful new backdrop was designed using your photos from our Photo Contest in 2013! Maybe yours will be featured? Secondly, once the sun sets in the evening, you will find that the dazzling light show will sparkle like new again. Work on the new backdrop is underway. Can't wait to see how it turns out! Be sure to check out the progress of these family classic refresh projects when you stop by to process your Season Passes for 2014! Our Office will be open Monday-Friday from 9:00am-4:30pm and Satuday from 10:00am-3:00pm. We are less than two weeks away from Season 118!